OFM Value Priced Computer Task Chair  Free Shipping! 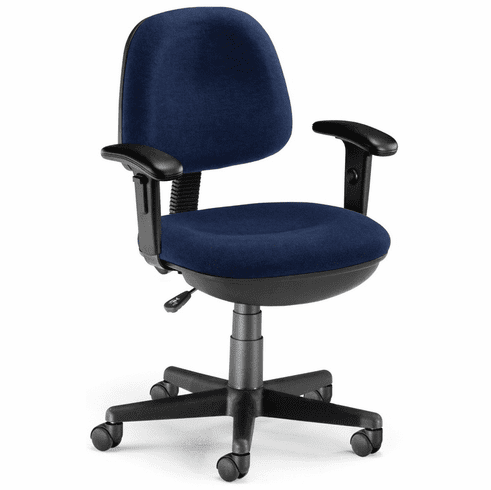 This computer task chair from OFM features a contoured seat and back, with lumbar support for added comfort, pneumatic height adjustment, back depth adjustment, optional adjustable height arms, Teflon-coated, stain-resistant fabric and a molded five-star base with standard dual wheel casters. Additional options like soft wheel casters for hardwood floors or fixed glides (keep the chair solidly in place) are available for a minimal charge. This chair meets or exceeds ANSI/BIFMA standards. Dimensions: Seat size: 18"W x 17"D. Back size: 16"W x 14"H Seat height adjustment: 17"-21"H. Limited lifetime warranty from OFM. These OFM computer task chairs normally ship within 1-2 business days from our NC or AZ warehouse.